Choosing favorite category. As a cash back card with tiered ongoing rewards, this card's 3% back on a category of your choice is unusual. Then it's 2% back at grocery stores and wholesale clubs, with a $2,500 quarterly cap on the 3 categories. 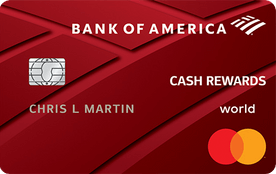 Our take: The Bank of America Cash Rewards card offers an exceptional rewards rate on a category of the user’s choice, allowing increased flexibility. But a $2,500 spending cap on bonus category rewards limits how much cardholders can earn.